These entrepreneurs are finding a way to keep their businesses centered on seemingly antiquated products alive and well. The funeral industry is well known for morbidly bragging that it'll never go out of business. But some industries aren't guaranteed to remain indefinitely. Barbara Wick, 68, joined the Wick family business in 1960 when she married her late husband, Martin. That was during the heyday of the pipe organ industry, she says. "A lot of churches were being built, and people were putting in pipe organs." Today, the churches are still going up, of course, but the demand for expensive, hand-crafted organs has long since disappeared. It began to slow down in the 1980s as cheaper "alternative instruments" came into play, as Wick wryly describes the new synthesizers and electronic organs that were dominating the landscape. Even as her and her husband's Highland, Illinois business, the Wicks Organ Company, was infused with new lifeblood--it's co-owned and operated by their five grown children who span 25 to 45 years in age--Barbara and Martin recognized that the pipe organ industry could soon draw its last breath. The pipe organ industry isn't alone. Once stalwart industries are now sickly or even dying. Sometimes it's a matter of new technologies, the way the computer virtually destroyed the typewriter industry, which amazingly still has two prominent companies left that mass produce typewriters: Lexmark International Inc., based in Kentucky, which makes electric typewriters, and Olivetti, in Italy, which manufactures manuals. Still, there's no question that it's a rapidly disappearing industry. In other cases, industries end because culture goes in another direction. Last year, Union Products Inc., stopped making the original pink flamingo lawn ornaments, a product that was once manufactured by many companies across the country, starting in the late 1950s. But just because an industry is dying doesn't mean it has to go extinct. In fact, it can be a prime opportunity for a few determined entrepreneurs, who can take advantage of the lack of competition. For instance, earlier this year, HMC International announced it had bought the copyright and plastic molds for the original pink flamingos and would soon be bringing them back. Meanwhile, the Columbus Washboard Company has the washboard market virtually all to itself. 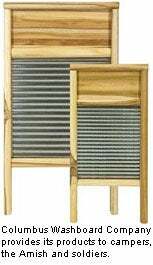 Only two other such businesses in the world exist, and the Columbus Washboard Company is the only washboard-making enterprise based in the U.S. The business has been around since 1895 when Frederic Martin Sr. started building washboards in his backyard and selling them. In 1998, George K. Richards, president of a Columbus, Ohio-based wholesale-pharmaceutical company, formed a partnership with six friends and bought the business from the great-niece of the original founder. To reduce costs, the company moved from Columbus to Logan, Ohio, but kept the name. "My friends thought we were crazy," says Jacqui Barnett, 61, a co-owner who also works as a factory manager. And for awhile, the friends seemed to be right. "We didn't do well for the first six years," Barnett admits. But in 2004, things started to improve. "So far, this year, we're doing well. We're very excited and finally showing some type of profit," says Barnett, who notes that their washboards are in Ace Hardware stores and 240 stores in the Do It Best Corporation, a buying cooperative in the hardware, lumber and building materials industry. Still, the demand for washboards isn't likely to ever replace washing machines, short of an apocalyptic scenario in which electricity disappears. That's why the company has opened up its factory for tours, bringing in school field trips and tourists. It's also being creative when it comes to marketing, touting more than the washboards' kitsch value. Many of their clients are campers, backpackers and even the Amish, a large group of whom live nearby. The company also has sent more than 4,000 washboard kits to American soldiers in Iraq and Afghanistan, providing them at cost. The Columbus Washboard Company is taking the right approach, says Clifton Lambreth, a marketing consultant who recently wrote the book, Ford and the American Dream, which focuses on the American auto industry, one that many have said is dying. "You have to remain flexible and be willing to adapt to changing demands or market conditions," says Lambreth. "If you fail to adapt, you will become extinct." In being flexible, he suggests finding ways that products can be adapted to other uses, and that's what Wicks Organ Company has been doing. Wick, which opened for business in the early 1900s might be around for another 100 years. It's added two companies to the organization: Wicks Aircraft Supply and Wicks Custom Woods. Because the organs are made of wood, and Martin Wick was a pilot and even built his own planes, branching out into these two companies isn't as odd as it at first sounds. The company is embracing the future of pipe organs as well, now offering digital organs, a replication of sound accessed from Wicks' pipe organs. "It's just a matter of adjusting your thinking" says Wick. "You often have a lot of potential under your fingers, but you have to have a different application, and if you feel very strongly about what you're doing, you will come up with the answers." But Wick says those answers won't be in alternative instruments like synthesizers. Likewise, Barnett doesn't envision expanding into what almost made their product irrelevant: electric washing machines. Just as important to these companies' futures are their pasts. "My husband and I are history buffs," says Barnett. "The fact that we're still able to make washboards with machinery from the early 1900s, thrills us."